While Ethiopia has been getting headlines about drought and food scarcity, the larger problem is the scorching Southern Africa is under as it bakes in drought - in some areas the wort in 80 years. 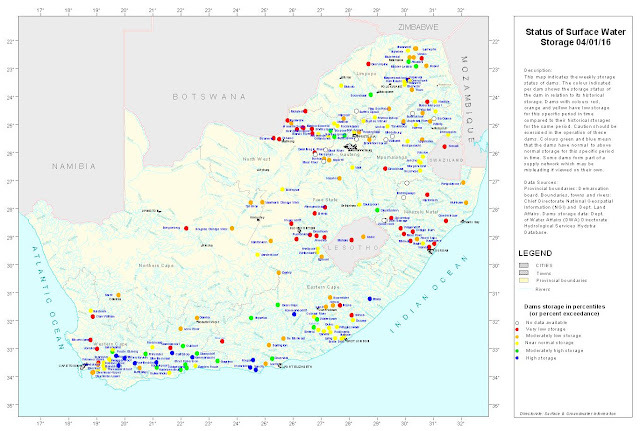 Dam levels are dropping, some are already dry. Water scarcity is increasing, and power rationing is in place in many countries. Crop failures are rampant across South Africa, Angola, Zimbabwe, Zambia and Mozambique. The Climate Prediction Center rainfall anomalies for the last 6 months portray the mounting dire situation. Rain shortfalls in many areas are 100-200 mm. the Democratic Republic of Congo has some areas with a decline of 300 mm, much in central tropical forest areas. As a percent of normal, some areas have received less than 50% of normal rainfall. The situation has not eased during the last 30 days, in fact it has gotten worse. The October to January rainfall anomalies depict some areas getting as low as 5% of normal precipitation, during what should normally be a rainy season. 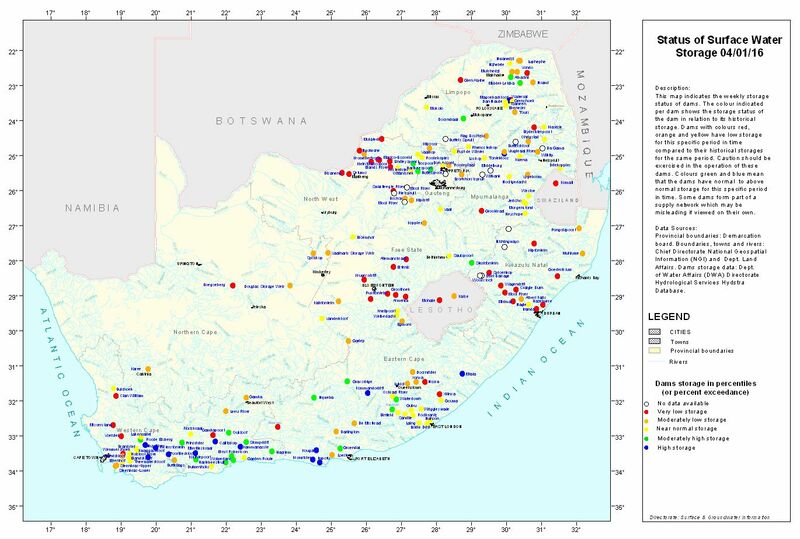 The impacts on surface water storage in South Africa reveal dropping reservoirs and water restrictions in major cities, plus water being tankered to outlying areas. Some dams are already at critical levels. 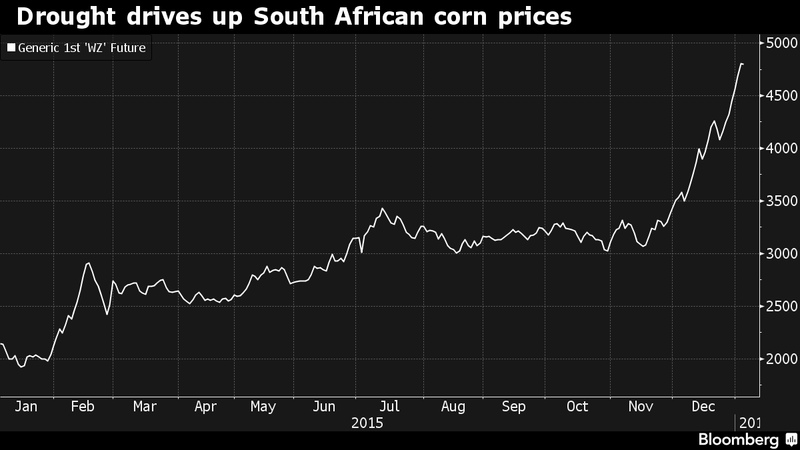 South Africa has just announced that it will have to import up to 5 million tons of corn to get through the next season. 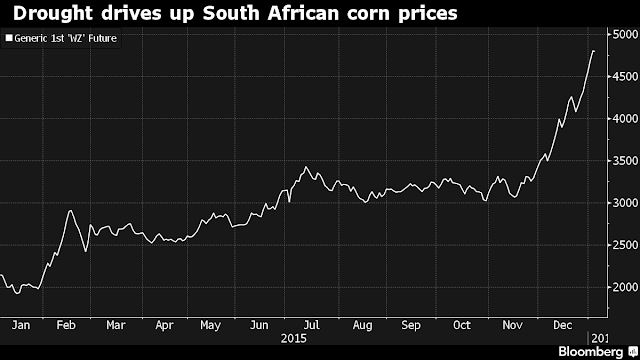 According to Yahoo-Reuters, Jannie de Villiers, Chief Executive of Grain SA stated today, "We can now, with a lot of confidence, say we are in a disaster in the maize belt,"
"We will be lucky if we produce 5 million tonnes this year and then we will need to import 5 million tonnes. This is the sort of scenario that we are looking at." AS Bloomberg reported, impacts have been a 250% increase in corn prices, much of the spike coming in November and December. The result is that millions are already in stages of deepening hunger. Zambia's government has banned government sales of corn to Zimbabwe, which has maybe 8 weeks of grain left to feed the country, not enough for the developing crisis. This leaves 1.5 million Zimbabweans facing severe food insecurity in the next two months, in addition to those already malnourished across the country.